Produced with high-quality Moroccan Argan Oil, harvested directly from freshly picked fruits and extracted utilizing state-of-the-art techniques. The Argan Oil is then enriched with organic Dead Sea Minerals and extracts, harvested directly at the sun-soaked Dead Sea Valley. Deeply conditions, nourishes and repairs naturally without any chemicals. Organic, Paraben free and FDA compliant. Hypoallergenic and safe for sensitive skin. Comprised of roughly 80% fatty acids, the CalilyLife Organic argan Face Cream works wonders to erase signs of premature aging. Regular use of argan oil cream has been known since ancient times to reduce the depth and severity of wrinkles, as well as to fade age spots by restoring skin's youthful elasticity and by increasing the regenerative rate of healthy skin cells. The high level of triterpenoids and deep hydration properties naturally found in argan oil offers amazing health benefits for skin including the ability to stunt the growth of warts, treat some forms of dermatitis and fade scars. Combined with the antioxidants and fatty acids, argan oil cream may also help with the treatment of mild acne and with the healing of acne-related scarring. Contains deep moisturizing properties that transforms skin into being amazingly soft and supple, effectively preventing stretch marks and other skin ailments. May be applied to nails to promote stronger, healthier nails naturally with high levels of Vitamin-E. / Being organic, Paraben free and FDA compliant, the Argan Oil Face Cream is hypoallergenic, is safe for sensitive skin and is not associated with any side effects. Directions: Wash and dry face. Apply evenly to face and neck every morning and night. For best results, use after using Calily Life Hyaluronic Vitamin C Serum. Safe to use under makeup. Avoid direct contact with eyes. For external use only. ALL-NATURAL & HIGH QUALITY - Produced with high-quality Moroccan Argan Oil, harvested directly from freshly picked fruits and extracted utilizing state-of-the-art techniques. The Argan Oil is then enriched with organic Dead Sea Minerals and extracts, harvested directly at the sun-soaked Dead Sea Valley. Deeply conditions, nourishes and repairs naturally without any chemicals. Organic, Paraben free and FDA compliant. Hypoallergenic and safe for sensitive skin. 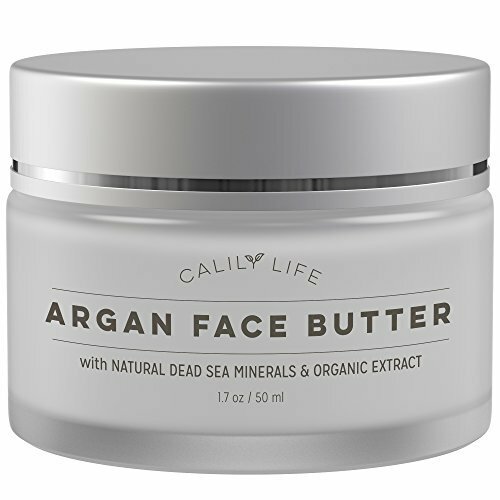 REMOVES WRINKLES & REGENERATES - Comprised of roughly 80% fatty acids, the CalilyLife Organic argan Face Cream works wonders to erase signs of premature aging. Regular use of argan oil cream has been known since ancient times to reduce the depth and severity of wrinkles, as well as to fade age spots by restoring skin's youthful elasticity and by increasing the regenerative rate of healthy skin cells. MOISTURIZES & FADES SCARS - The high level of triterpenoids and deep hydration properties naturally found in argan oil offers amazing health benefits for skin including the ability to stunt the growth of warts, treat some forms of dermatitis and fade scars. Combined with the antioxidants and fatty acids, argan oil cream may also help with the treatment of mild acne and with the healing of acne-related scarring. PROTECTS & RESTORES - The rich antioxidants naturally present in argan oil helps to protect skin and nails from damage caused by UV radiation. Applying Organic Argan Face Cream to UV damaged skin may actually fade sun spots and heal the dry leathery skin that results from over-exposure to UV, and promote the regeneration of healthy cells. PREVENTS & STRENGTHENS - Contains deep moisturizing properties that transforms skin into being amazingly soft and supple, effectively preventing stretch marks and other skin ailments. May be applied to nails to promote stronger, healthier nails naturally with high levels of Vitamin-E. / Being organic, Paraben free and FDA compliant, the Argan Oil Face Cream is hypoallergenic, is safe for sensitive skin and is not associated with any side effects.